Many regions of our country are busy in celebrating the Ganesh Pooja from 25th August 2017 . This festival lasts for 10 days. Devotees who believe in lord Ganesha bring the idols on the very fist day and depending upon their wishes go for its immersion after keeping them in house for one and a half , 3,5 ,7 day or full period of 10 days. The Ganesh Puja started in Pune by freedom fighter Lok Manya Bal Gangadhar Tilak in 1894. This year Pune and Mumbai are celebrating 125 years of Ganeshotsav and are geared for a 10 days fervour. Was Lord Ganesha married ?. South Indians feel that he was a bachelor. But Ganesh Purana contain description of Ganesha flanked by Siddhi and Bhuddhi. In Northern India two female figures are said to be of Siddhi (intellectual and Spiritual ) and Riddhi (Wealth and Prosperity ). In most of the iconography Lord Ganesha is shown to a married God like others. In fact Lord Shiva and Goddess Parvati was interested in getting married the two of their sons Kartik and Ganesha. In order to decide who should get married first, they asked to take round of the earth and first to come would get married first. As soon as it was declared Kartik mounted his peacock and left. After his brother left ,after paying respect to both of them ,Ganesha took round of both the parents 7 times and told that he has completed the journey. He got married with Riddhi and Siddhi, said to be daughters of Lord Brahma. 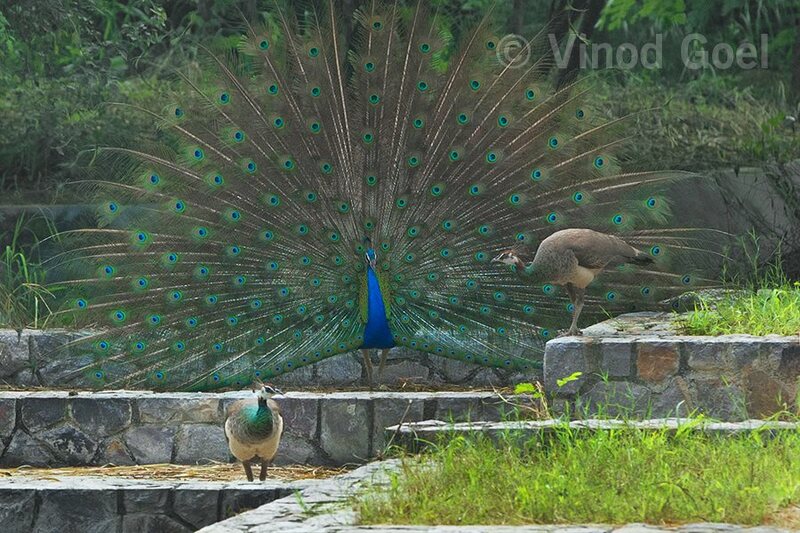 On 26th of August while I was shooting courtship of peacock in the heart of Delhi , I found a situation where peacock was flanked by two peahen and both of them showed interest in him. After I came to my house and examined the images I realized that this is the perfect representation of Lord Ganesha with his two consorts namely Riddhi and Siddhi.